Foam fraction set offers three unique ways to introduce common fractions to your students. Lightweight foam pieces are safe and quiet to handle to prevent distracting others in the room. Plus, the sturdy foam pieces are washable to ensure sanitary, long-lasting use. Fraction squares and circles are colored to help students accurately visualize their differences. 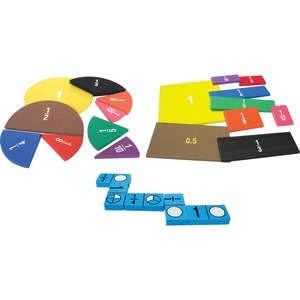 Set includes foam fraction squares, foam fraction circles and foam fraction dominoes. Fraction set is designed for children attending kindergarten and above.